i think that's the third, so perhaps... every 8 years??? Wait... why do we need new turf? Football plays on it during Spring practice then regular season practice and games . Then add two soccer teams with games and practice and two lax teams with games and practice and then some high school football play offs and high school lax play offs. Our field gets used . That sounds more like routine maintenance to me though. 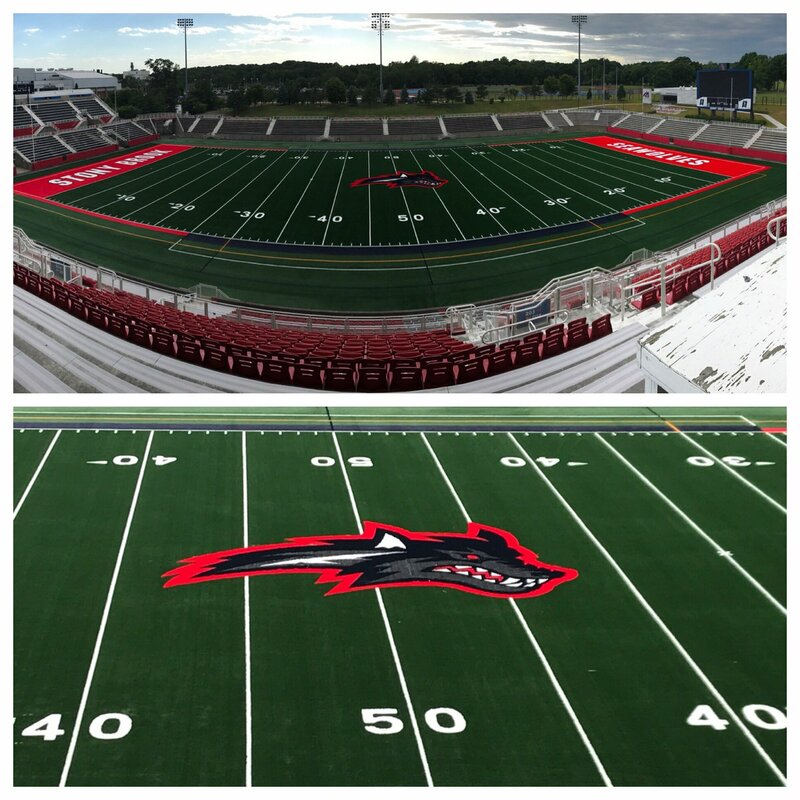 When I heard new turf, I thought we were switching the type we had with a new kind of turf. Doesn't make a difference to me as long as what we've got is well maintained. Certain types of turf tend to cause more injuries. sorry i meant the turf is being changed over to a newer turf but i assume it's the same material. graduation must put some stress on it too. Forgot about graduation plus movie night during the summer. It does get a lot of use which is good. Turf fields have to be certified every couple yrs to play on. After a certain amount of yrs and usage it wont be certified to play on. 8 - 10 yrs is about the limit. If any of you guys voted yes for your high schools to pass a bond to get a turf field installed, you expect the same bond rwuest to come up when they have to replace it. i kinda wish they stuck with the interlocking SB logo. more classic. that's the brand we are building. I like the Wolfie logo more, but as long as the SB logo doesn't disappear completely I'm ok with it. I love it. Beautifully done!! A lot cleaner without all the soccer lines, LAX lines, etc. that were on it before. Really looks great and thanks for the terrific photos guys !